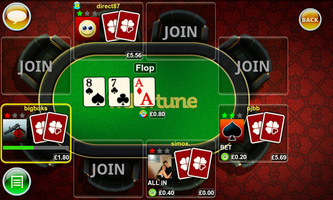 mFortune are one of the biggest mobile casinos in the United Kingdom. They've now used their mobile expertise to produce a poker app that offers real money ring games and tournaments on virtually every type of smartphone and tablet. 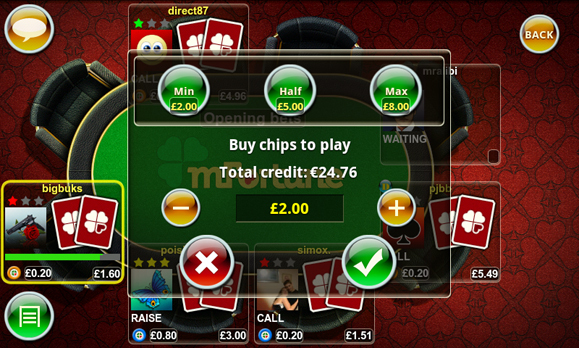 Play poker on iOS, Android, Symbian, Windows & more. Take advantage of some of the fishiest player online. New players get a £5 bonus when they download. Invite your friends to play at private tablet you create. Tag poor players so you can find them in the future. 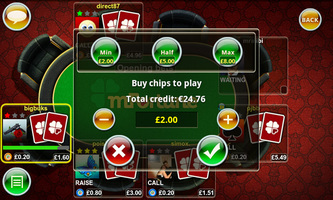 While plenty of iPhone poker apps have been designed with a specific platform in mind or simply rely on various web-browser based technologies to provide you with access to the tables, mFortune – a previously unknown poker site focusing exclusively on mobile poker solutions - took a new, innovative approach. The result of this approach is a software package that behaves exactly the same whether you’re playing on an Android device, iPad, iPhone or even Blackberry. As a result, mFortune offers the same, equal experience to all kinds of mobile players while giving you access to a high-quality downloadable app and avoiding the trappings of relying on a browser, such as longer loading time and a small number of customization options. 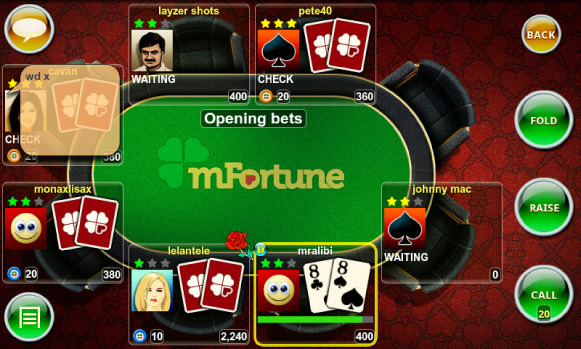 Most iPhone poker apps released by new or small companies can’t really compare with what the industry giants have in store for mobile users, but mFortune is a notable exception in this regard. The lobby and table mode share a pleasant red and white theme, but fortunately the developers of the app didn’t really allow all the eye candy to get in the way of functionality. As a result, the buttons are readily distinguishable from the background and are easy to click on the small iPhone screen. Consequently, the menus are easy to navigate and the whole app has a solid, professional feel to it. The lobby itself allows you to access other mFortune games, as well as an extensive help page with plenty of valuable novice-level poker tips and the poker app’s social functions. What’s more, it is here that you can read about the Refer a Friend program, which will pay you £5 for each person you convinced to join the site. Nevertheless, all those options are just an addition to the main play modes, which give you a chance to try mFortune’s take on online poker. The Play for fun mode allows you to test the app and compete against other players without risking your bankroll, as all the chips you’ll be using here are virtual and can’t be converted into real money. I’d recommend sticking with this mode for a while if you don’t have any real poker experience, as learning the basic concepts may be a rather costly endeavor if you don’t really know what you’re doing. Even if you’re a seasoned player, it’s probably a good idea to give it an hour or two – especially since the mFortune app feels rather unique when compared with other iPhone poker clients. After you begin feeling comfortable with using the app, you’ll certainly want to get serious and Play for real. Unfortunately, Texas Hold’em is the only available poker variant right now and there’s no multi-tabling functionality, but you’re given absolute freedom of choice when it comes to picking the tables and stakes you want to play. Even better, the mFortune iPhone app allows you to add other users to a private friend list so that you can message them after the game or even join them at a private table. Combined with a neat and dependable player search function, this allows mFortune to serve as a perfectly functional platform for poker lessons or even pub games with your real-life buddies. Another thing that sets mFortune apart from other mobile poker sites is the fact that it doesn’t belong to any major poker network. Obviously, this comes with a distinct set of advantages and a fair share of problems. First of all, you’re guaranteed to be facing players who won’t have any software advantage on you, as all version of mFortune’s app are basically the same in terms of functionality – even a desktop user won’t have an edge here. Aside from that, the competition is ridiculously soft, allowing you to consistently profit from the game even if your own skills aren’t really well-developed yet, which makes mFortune a perfect hunting ground for intermediate players. Even if you run into an odd tight player, you can always switch to another table to avoid him. The drawback here is the fact that there simply won’t be all that many people playing, especially during the night hours. Fortunately, the traffic isn’t as low as on some other small sites, so unless you want to play high stakes during early morning hours you’re quite likely to find at least one good table to join. 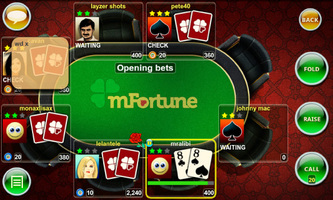 Once you decide to give mFortune a try, you’ll have to download its software package. Don’t worry though, as the whole process is extremely simple – you send the room your phone number and they immediately text you back with a download link for the app. Aside from that, you’ll have to sign up for an account – I recommend using your desktop computer for that if possible, as there will be quite a few forms to fill. While mFortune might not really appeal to your tastes if you’re looking for exotic poker variants or a high-traffic iPhone poker option, the app itself is extremely well developed and will put a smile on any real Texas Hold’em enthusiast’s face. 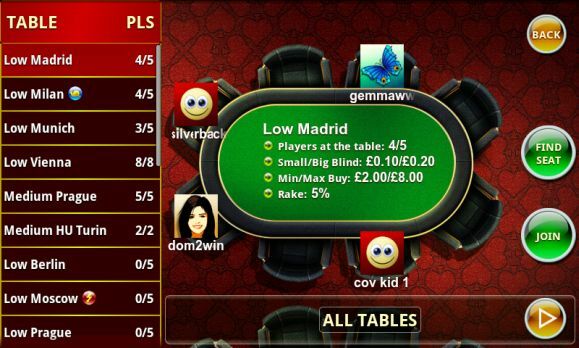 The social functions are a welcome addition in the rather faceless world of mobile poker and the wide selection of neat bonuses and prizes definitely increases the overall value of playing on the site. 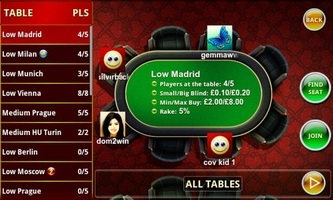 All in all, it’d be hard to come up with a better mobile app for novice and intermediate Hold’em players. Read our reviews of these other top iPhone apps.